At Louis’ everyone feels welcome. Problem is, you may never want to leave. It’s difficult to know where to begin when describing Louis’ Restaurant & Pizzeria to someone who has never been there. Sure it’s a good old-fashioned neighbourhood diner with charming service and feel-good food like hot turkey sandwiches and mile-high coconut cream pie. All I can say is that on my first visit I was reminded of a character in my daughter’s bedtime story, Little Miss Sunshine. One day, the protagonist finds herself in Miseryland where she meets a weeping King. She convinces him to rename the place Laughterland. And just like that, all of his unhappiness disappears and he begins smiling, laughing, chuckling, and giggling. To talk about Louis’ in the context of other old-school Ottawa pizzeria institutions wouldn’t be fair — as far as I’m concerned it’s in a class of its own. Walking through the doors is like entering a living museum to Ottawa’s own Happy Days (jukebox and all!). The modern world literally disappears and a kinder, gentler place exists within the walls of this 1960s wood-paneled, orange vinyl rec-room-with-a-view. It’s the kind of convivial community gathering place one imagines once existed but is long extinct. Here all walks of life and all generations make themselves at home — from great-grannies and burly construction workers to tiny babies teetering on tabletops in their car seats — everyone crowds into booths and banquettes for a hearty helping of hospitality and soul-satisfying food. Which brings me to the famous pizza — we ordered the Louis’ Special, a combination of pepperoni, mushrooms, green peppers, olives, and bacon (bravo for making each strip crisp!). The crust was thick, deeply golden and surprisingly (relatively) light, almost brioche-like. I noticed a yellow hue and assumed this was some kind of egg dough but our server assured me there are no eggs in the homemade dough. When I pressed for further details she said she was sworn to secrecy. I dared not ask about the soft subtle (cinnamon?) spice in the pizza sauce. 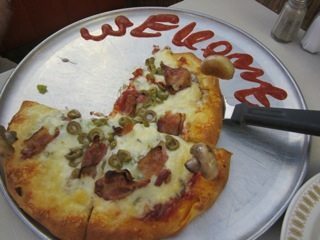 That same sauce was used to spell out the word “welcome” next to my pizza on the circular tray, but they already had me at the random toothpick treasures. Whole roasted mushrooms and tiny bits of canned pineapple were artfully arranged and speared around the crust, delivered like a little dart-board care package from the kitchen. Sure, I may be the last person in town to discover this wildly popular 52-year-old gem of a joint. But if for some reason you too have yet to experience Louis’, my question is: what are you waiting for?